While watching the HBO documentary “Love, Marilyn”, my husband Kurt and I were surprised to hear the depth of the intelligence and insight found in Marilyn Monroe’s private thoughts as she recorded in her journals and personal papers. Her screen persona did not prepare us for the searching and self-educated-by-reading young woman who wrote so movingly. Marilyn Monroe reading a script. As I heard her, Monroe seemed to be saying that her work was the love that never let her down and that resonated with me. After leaving my nearly 20-year communications director job at the University of Tennessee, I have come to more fully understand the gift that work has been in my life. I loved working for the university where I essentially grew up–since I was hired when I was only 19 years old. I worked full-time and, by virtual of that fact, received two free classes each quarter which allowed me to work toward a college education I would not otherwise have been able to afford. 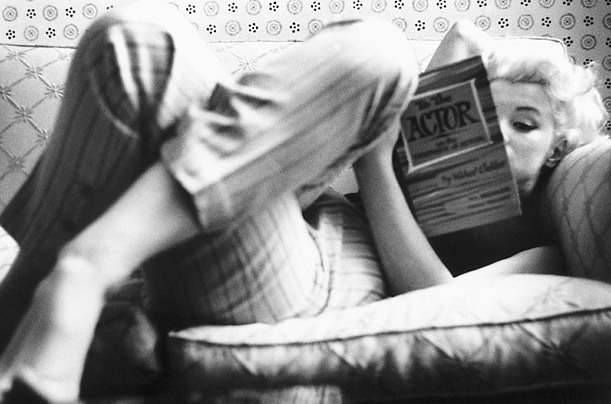 Although her formal education was limited, Marilyn Monroe educated herself through reading. Knowing for myself has been my passion in life, which I think it was for Marilyn as well. All my life I have been reading, always reading, disappearing into worlds of words and imaginings of others that lived long before me or never actually lived at all. It does not matter whether I am reading fiction or non-fiction because the people I meet in books have educated me as I have shared their real or imagined lives. Something else I shared with Monroe was the attendant shame that comes with doing without. For her, it was the lack of a real family. For me it was being poor, raised to worry about the next time Daddy would lose his job. Watching my proud parents crying in the car after their Sunday School class had taken up a collection for our family that morning. The powerlessness of not mattering in a society where money and power over your life are synonymous. But the knowing for myself trumped the not having. My work–and from that my education—gave me a way to clothe, feed, and care for my children as a single parent and a way to ensure they were in loving, safe hands while I worked. 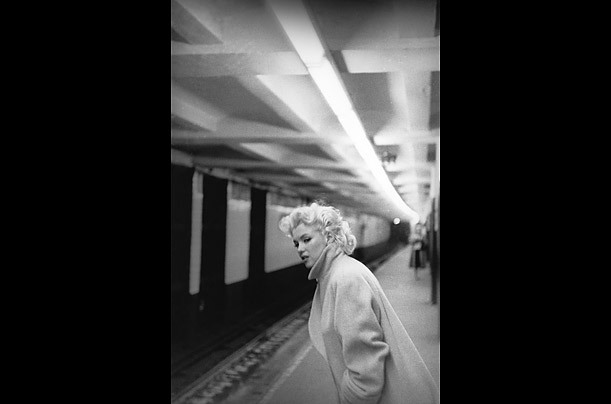 Monroe in the subway when she was taking acting classes in New York. But work gave me more than that. It was my life. It was, as Marilyn described, a kind of love that I have missed in my nearly two years of freelance work experiences. In my final five years at UT, I was promoted by a vice president who gave me a challenge and enough power to fulfill it. I worked with a communications team of four who worked together beautifully. During one of the many reorganizations that naturally occur in large, complex organizations, our team inherited the university alumni association’s yearbook collection. This treasure trove of memories and priceless photos was perfect for use in the publications we produced to encourage charitably minded people to invest in the university’s programs. 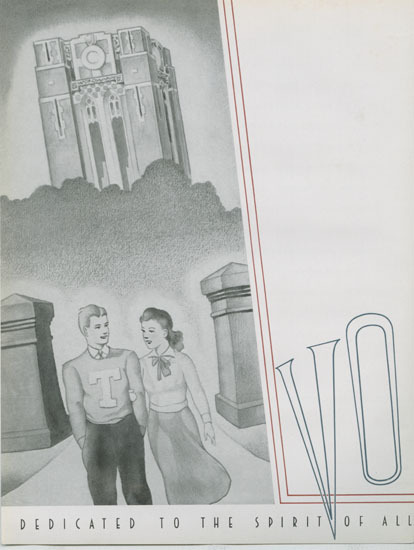 Called The Volunteer after our home state’s motto, the yearbooks had been published every year since 1897, except in 1918 during the first World War. Besides the year young volunteers were lost to trench madness, we found that we were missing one other volume–the exact year of which escapes me now. Being uncomfortably short only one piece from a complete collection inspired me to invent a way to overcome our loss. Surely there was someone who had inherited a copy of the missing volume and would not mind giving it to us. It also occurred to me that there were graduates who had misplaced their yearbooks, never bought one and now regretted it, or conversely there surely were people who found themselves in possession of a yearbook or two for which they had no attachment or use. Loss being the mother of invention, we began placing small blurbs in our publications about our Yearbook Exchange Program. And we got all sorts of queries and many people who had as many as four yearbooks they were glad to send us. 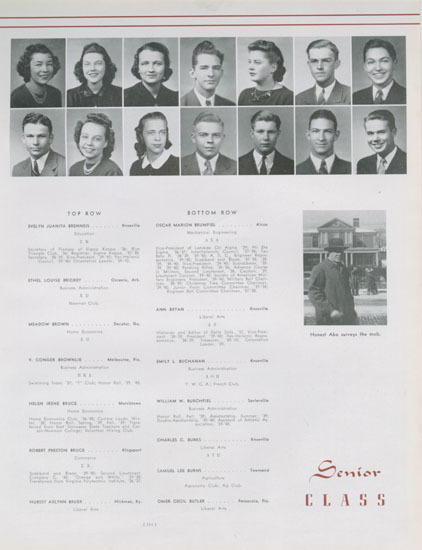 Brum Brumfiel’s 1940 senior yearbook page. 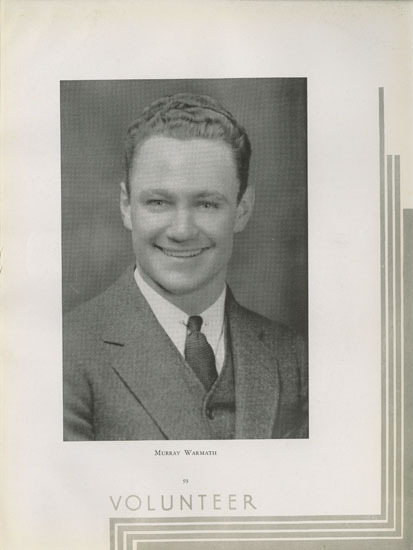 We also heard from Oscar Marion “Brum” Brumfiel (his nickname given to him by his buddies in World War II; and yes, his name is correctly spelled without the ending “d”), a gracious 1940 UT graduate living in Minnesota who had lost his senior-class yearbook to water damage. Could we locate a 1940 yearbook for him? Joyously I could report we had an extra copy and could send it to him straight away. Brum went on to tell me that he and his wife were amazed and elated to find that another UT alum, the incredibly successful football coach Murray Warmath, was in the nursing-home portion of the assisted-living facility where they lived. Murray Warmath (far left) played end for the 1934 UT football team. Warmath had been a standout football player at the University of Tennessee, graduated in 1934, and went on to be a legendary coach who led his Minnesota Gophers team to the national championship in 1960. Coach Warmath’s wife, Mary Louise, had passed away a few years before. On the days when his faculties were clear, Murray told Brum about his dear wife and how she was a university beauty whose photo appeared with the other lovelies in the college yearbook. 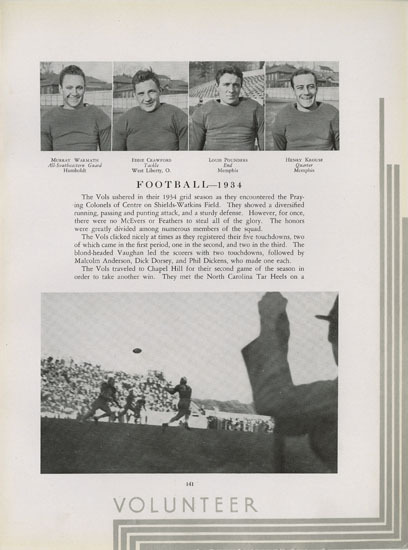 This famous football coach who had won the highest accolades of his sport had no pictures of his dear wife from their time in college, and neither he nor his wife had bought the 1934 yearbook. He so longed to see her again. Murray Warmath won the coveted Torchbearer award in 1934, the university’s highest student honor. 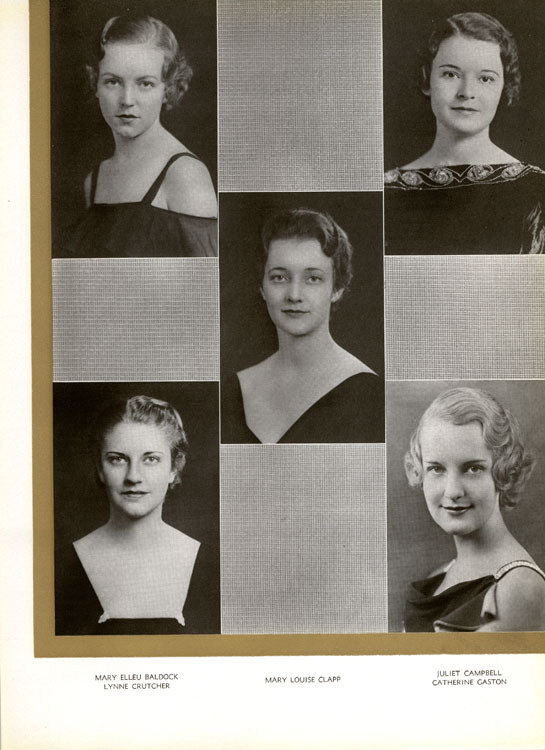 I checked our collection to see if we had an extra copy of the 1934 yearbook, and amazingly we did. With great anticipation, I sent the copy, via Federal Express, to the Minnesota address I had been given. Mary Louise Clapp (center) campus beauty in 1934. When I next heard from Brum, he described the joyous smile on the coach’s face when he saw his dear wife’s photo, so young and beautiful, just as she was when he met her and as she would always be to him. He could not understand how he came to have the book with her photo, but he was so grateful for this miraculous book that returned his wife to him. I learned recently that Murray passed away March 16, 2011, at the age of 98. No part of my work gave me more joy than being able to make this sweet man’s dream come true: to see his wife again as she was in his memory. Work has been a privilege for me because it has given me the ability to make a difference in people’s lives. For me, it was put so very succinctly by a woman known for style over substance: Work is a kind of love. This entry was posted in Autobiographical, Happiness, Ideas, Love, Photography, Screen, Tribute, Work. Bookmark the permalink.